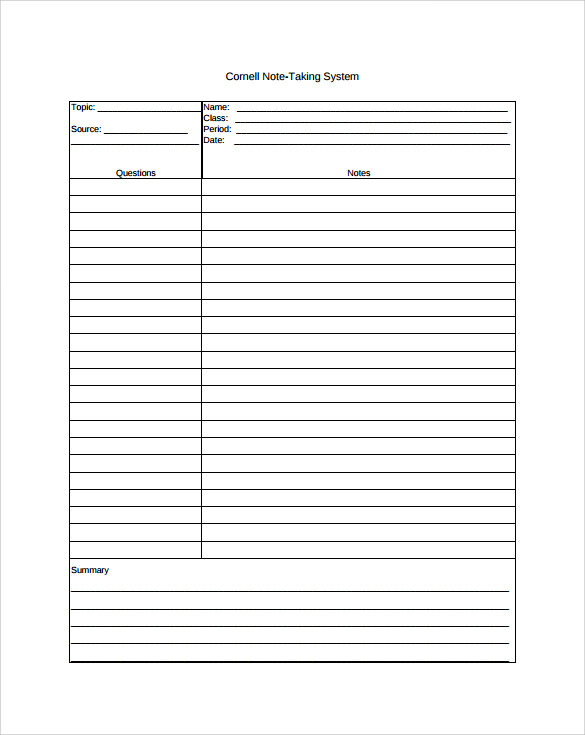 These tools called Cornell Note Templates can help you to take better notes that can be made into a format that is computer friendly. These can be used during lectures at university or college, but they can also be used for speech, press, reporting, news and dissertations. The left column is where you would write down the questions and the right is for the answer, so here are a few to look at. A simple option and you can write down the topic, your name, class, period, source and date. 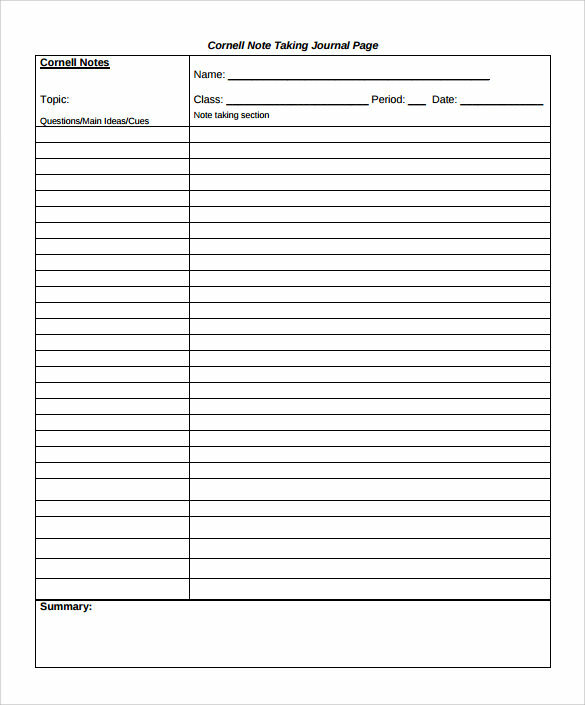 You can then write down any questions or major topics that you write about in the left column and write down the comments or answers regarding the topic in the right column. 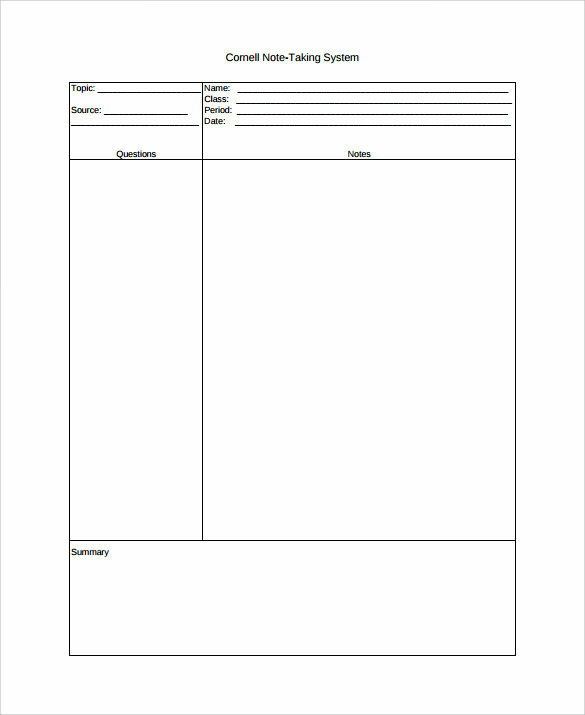 A template with simplistic design that you can use for note taking and it also has information regarding the chapter, name, date, period and section. You can write down the vocabulary, main ideas and questions in the left column and then the sentences, examples, definitions, answers and notes in the right one. 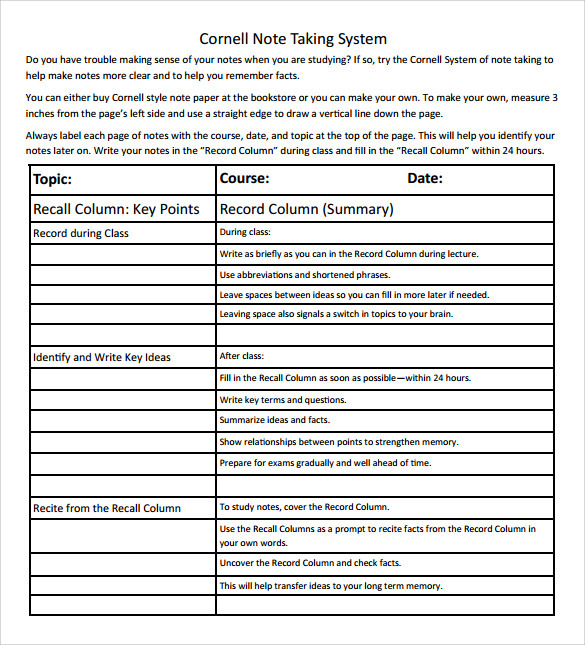 This is a general Cornell note taking template that you can download and use without having to create your own. It has a left column that is labeled as recall clues where you would write down questions, phrases or vocabulary and in the right column you would right down your notes. There is also a summary section where you can summarize the notes on every page. 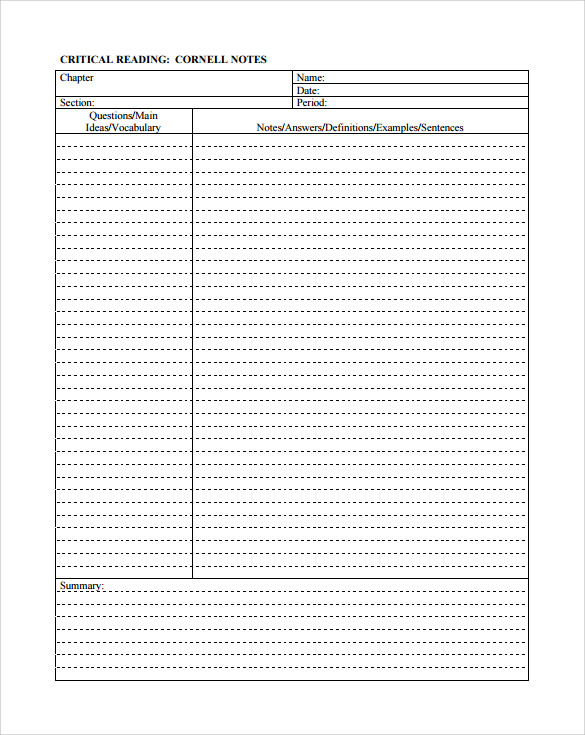 This is another good option that you can download and fill in. There are areas for the topic, source, name, class, period and date. You can fill in the left column with any questions, topics, keywords or vocabulary that are important and fill in the right column with the required information. 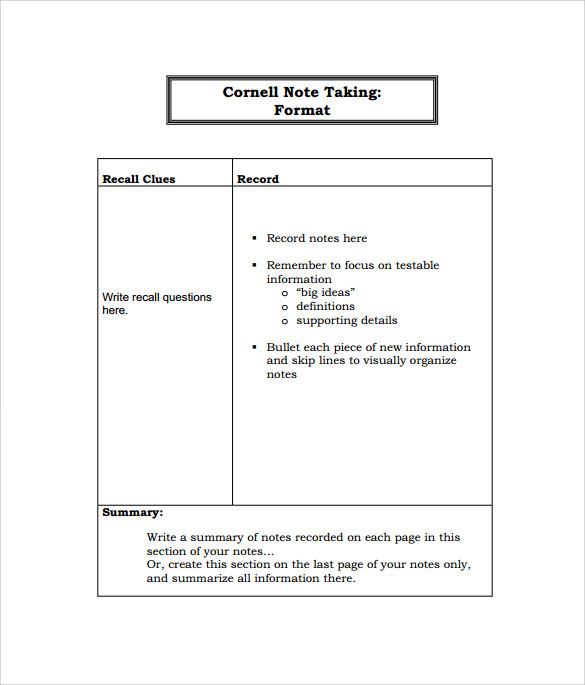 This Cornell note taking template is simple and you can put down the same information as the others, including the date, name, period, class and topic. You can then jot down the cues, main ideas and questions in the left column and the notes in the right column. There is also a space for a summary at the bottom of the page. Unique and different than the others, it has a slot where you can write down the key points while you are in class and then a place for a summary of those points in the right column. You can also have another section where you recall whatever you can remember from the class, along with the important information after. 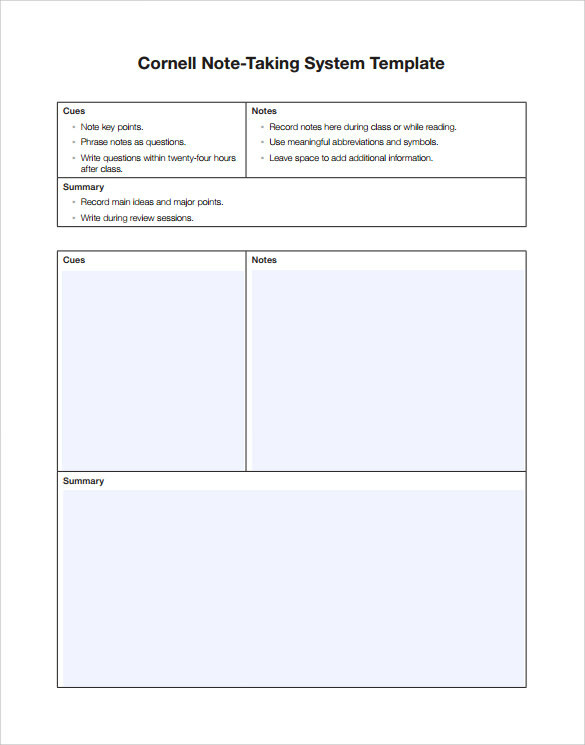 This is another pretty simple one that you can use and it has an area for the information about the class, including the period, date, topic and much more. It has a left column, which is where the questions, keywords and phrases are put and then a right column where you can write an explanation about what is in the left column. This is one that has a bit more information on it and it explains to you what you are looking for and what you should use as cues. There is a small section where you can write down the cues, keywords, ideas and anything else that strikes you and then fill in the required information in the right column and then the summary of your notes in the bottom. This one you can download and print out, which makes everything easier. There is a section that is labeled cues and another for note taking. You can jot down what you can remember after the class, if you don’t do it while in class, as well as the information about each cue in the right column. 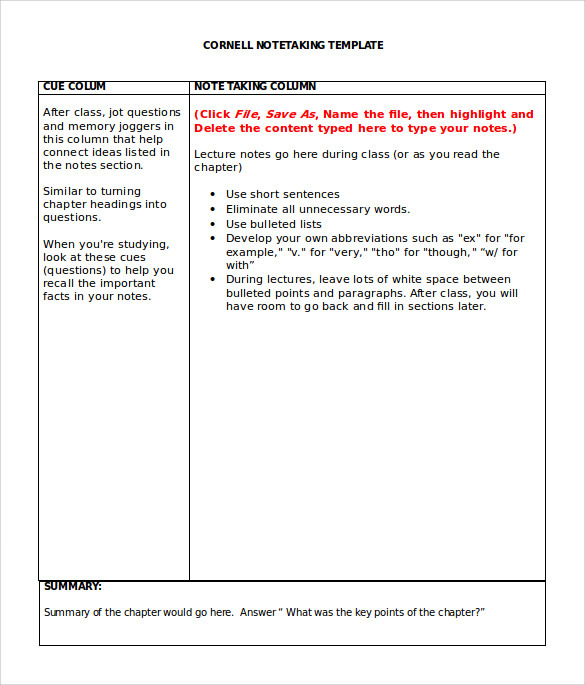 Taking down notes will now become easier and systematic with these awesome creations of Cornell note taking templates.